One hundred fifty years ago years ago Lieutenant General U. S. Grant had been appointed General in Chief of the Union armies. His strategic objective in the east was the elimination of General Lee’s Army of Northern Virginia, and he thus issued orders to Major General Mead, commander of the Army of the Potomac, to go were ever General Lee goes. 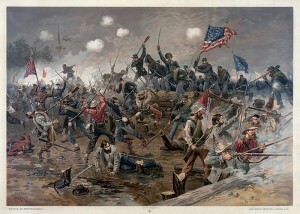 To ensure that there were no misunderstandings, Grant chose to locate his headquarters in the field with the Army of the Potomac. Lee was hoping for a miracle as he fought a series of delaying battles while withdrawing his army from the Rappahannock River, southward, toward Richmond. This series of battles, known as the Overland Campaign, began with the Battle of the Wilderness on 5 May 1864, and ended on 24 May 1864 at the Battle of St. Mary’s Church.The Battle of Spotsylvania C. H. was one of these battles, occurring 9-20 May. Wayne County was represented in this campaign by two units, E Company of the 4th Ohio Volunteer Infantry, and B Company of the 60th Ohio Volunteer Infantry. Wayne County native, First Sergeant Michael Silver, was killed in action on 9 May 1864 in the opening hours of the Battle of Spotsylvania C. H. An accounting of his service and death in the Civil War can be found in Julie Pooler’s article, “WCHS Aquires Rare Wooden Civil War Tombstone Marker”, and Susan Zimmerman’s article, “Michael Silver Killed in Action during Civil War”.